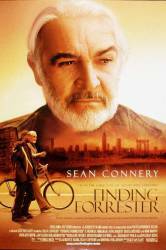 Factual error: In one scene in "Finding Forrester", Sean Connery's character video-tapes a bird from his apartment window, proclaiming that it is an "adult male...Connecticut Warbler." He then shows the image on his camcorder to Rob Brown's character and the audience. But the image we see is NOT a Connecticut Warbler. It is an adult male Yellow Warbler. There's no way to confuse the two species. The Yellow Warbler is very distinctive: all yellow, with faint chestnut streaking on its chest. The Connecticut Warbler has a greenish back and a grey "hood" (head, throat, and chest). If he HAD shown a picture of a Connecticut Warbler, that might have been confusing, because there are other warblers that look like a Connecticut. But the Yellow Warbler is unmistakable, and the brief glimpse in the movie left me with no doubt. It is such a simple, and obvious mistake, that I must wonder if they made it on purpose, just to test the audience. Anyone who could come up with the name "Connecticut Warbler" would have to know what one looks like, or at least have easy access to an image (there's zillions on the web, not to mention in scores of books, including ANY guide to North American birds). Even assuming the filmmakers had correctly depicted a Connecticut warbler on Sean Connery's camcorder, the likelihood of this species appearing outside a third-story window in the Bronx is practically nil. Connecticut warblers are extremely secretive birds that do not perch in trees, but walk on the ground, amongst dense vegetation. Furthermore, they are not in the New York area, but occur there only on rare occasions during migration. Even in its proper habitat, a sighting of one is considered exceptional. Factual error: In every shot of William Forrester's apartment building you can clearly see that he lives on the top floor, yet when we see scenes shot inside the apartment building but outside William's apartment you can always clearly see another set of stairs leading up. Where are they going? They are too high to be heading for the roof.